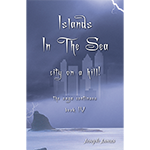 Islands in the Sea: City On A Hill! | Book 4  - $13.99 : Beneficial Zone, Everything is permissible, not everything is beneficial! Dan, Susan, John, and Nikki answered the call in Islands In The Sea: The King Walks In! Book 1, in the The Lion Roars! Book 2, and then again in Illegitimate? Book 3, but now that one-third of the city is destroyed and under water, can they save the rest of the it. The cult is seeking revenge and the dark sentinels have moved to a better vantage point, but something even bigger and more sinister is approaching quickly in the distance. Can they decipher the coded cave system before it’s too late and more of the city falls? Dan’s reputation is on the line from false reports and they called in reinforcements from around the country, the UK and Australia, but will help arrive in time? They had stopped the cult’s evil scheme to destroy the city by disarming the remaining bombs, but there is a greater secret still lying beneath the rest of the city that the cult is willing to destroy at all costs. Alex, Dan’s angel is again on the scene and the visions continue, but is it enough? The remaining connecting tunnels are even more difficult to uncover and they will require an outside source to do it in time. Can they connect? There’s an unexpected treasure just waiting to be found as well. Can it all be done? Time is of the essence! Join Dan, Susan and their global team as they dare to do the impossible and save the rest of the old city while building a new one on the hill! *** SHIPPING PLEASE NOTE *** | We currently only ship within the USA. To order books outside the USA, please click on the links to Amazon, Kindle and Nook. OR Contact Us for Special Orders & Info. This product was added to our catalog on Sunday 01 October, 2017.